Welcome to the Wayne Poole Racing web site. 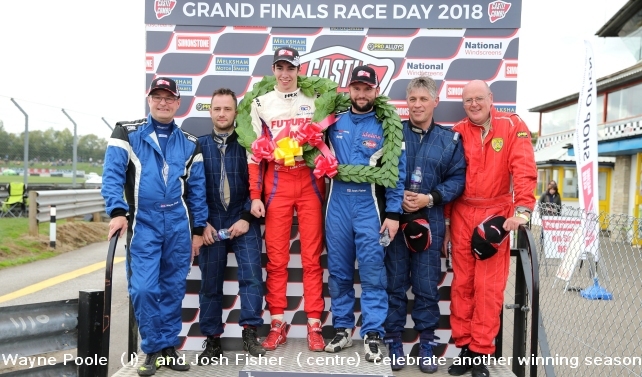 WPR are an experienced and professional race team, operating for over ten years and specialising in Formula Ford 1600, saloons and sports racing (GT) race cars. We are based in Gloucestershire and have an extensive staff of successful racers and qualified mechanics. With twenty years experience in preparing winning 1600 Formula Fords, WPR also prepare and provide a full rebuild service for GTs, Saloons and Historic racers for their customers. If you have a car and are looking to join a successful team, are just getting started and need advice	or want a try out in one of the team's cars then contact us right away. Celebrating their 20th anniversary in 2019 the WPR team will be running three Van Diemens for Josh Fisher (JL14), Steve Bracegirdle (RF89) and James Colborn (RF89) together with three Minis for Guy Parr, Steve Bracegirdle and Graham Cox. The season will largely be contested at Castle Combe but other drivers including Andrew Higginbottom and events are on the schedule. With a consistent record of success and a professional image the WPR team provides unbeatable sponsorship value in club motor sport. Sponsors/partners packages can be tailored to suit all types of business and level of brand exposure required. Together with race trucks and multi car trailers WPR are equipped with all the necessary equipment to manage as many as 10 cars at an event. A large pool of experienced engineers and mechanics are complemented by some of the best hospitality services to be found in club motor sport.